You can find part one of this post here. Read that one first and then come back or read this one first and then check out part one, it doesn't really matter, the only thing you might possibly miss out on is the (not even slightly) thrilling suspense of whether or not I will love the movie version of Priscilla, Queen of the Desert as much as I loved the musical. I think you can probably already guess the answer to that judging by the kinds of films on this list but hey, it never hurts to hedge your bets. Honestly, I don't even know what I'm saying anymore, I'm just going to get on with talking about the rest of the films now. Armand, the owner of popular cabaret club The Birdcage, and his partner Albert, the club's star drag performer, agree to pretend to be straight for an evening so that Armand's son Val can make a good impression on his fiancée's right-wing parents. Of course nothing goes as planned. In many ways The Birdcage, based on the French film La Cage aux Folles, is a traditional farce. It's hilarious, for a start, and the humour mostly lies in a series of things going spectacularly wrong and in Armand's wonderful one liners. However, there are also some incredibly sweet moments and at its heart this is really a film about family. There is a moment in which Armand tells Val not to talk to him for a while, I'm sure you could hear my heart shatter from the other side of the world, and that's just one example of many times in which the seriousness of what Val is asking of his parents peeks through the humour to betray just how hurt Armand and Albert really are by the request. Really, as funny as I found the film, my favourite parts were definitely these more subtle, tender moments between characters. 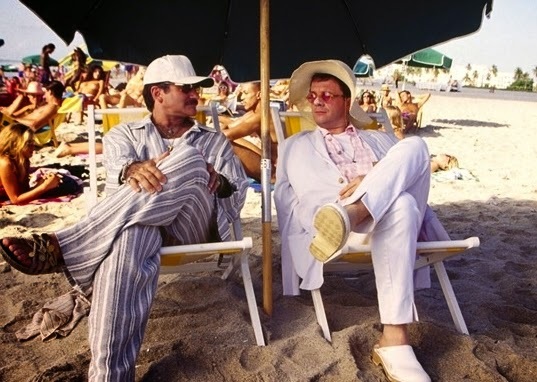 The Birdcage is a beautifully balanced film; a farce in the truest sense of the word, with a tender message weaved throughout. Famous actor Johnny Marco looks after his eleven year old daughter Cleo for a few days before she heads off to summer camp. That's kind of it. Sofia Coppola has this amazing talent. She can make a film in which nothing much happens, in which nothing much is said, in which none of the characters really do very much at all, and somehow she can make me totally feel it. Usually you would expect a film about a film star to be fast paced but Coppola makes it slow, and that feels right. I feel the change in Johnny by the end of the film and I totally buy it, I see it happening throughout, but even if I tried I wouldn't be able to pinpoint an exact moment in which it happens because, just like life, it happens gradually. I don't know how she does it. In anyone else's hands this film would have bored me stupid but in hers, I really enjoyed it, and by the end I had a dopey big grin all over my dopey big face. Scott should be on his way to winning the Australian Pan Pacific Ballroom Championships this year but it won't happen unless he stops dancing his own steps. Everyone in his life wants him to stick to the moves approved by the Ballroom Confederation, except for Fran, a total beginner who wants to dance with Scott, his way, at the competition, even if it means they might not win. In my last post I mentioned how much I love Wes Anderson but there is one director I love more and that is Mr. Baz Luhrmann. I've seen Strictly Ballroom more times than I can count and it's probably my favourite film ever, or at least in the top three. Every time I watch it I fall more in love. If you're a fan of any of Luhrmann's other films then this is a must see. It's his first film and, in my opinion, still his best. The Baz Luhrmann trademark style is already in evidence here, even if the budget is nowhere near that of Moulin Rouge! or The Great Gatsby, but there's also a great sense of humour, which at times almost borders on surreal, that somehow grounds this film a little less in the clouds than the others. Strictly Ballroom is wickedly funny and it pokes fun at the world of ballroom dancing in a very fond and knowing way, which is utterly endearing. What I find really special about it though is how hopeful the film really is. Also Scott's dad, Scott's dad is great. 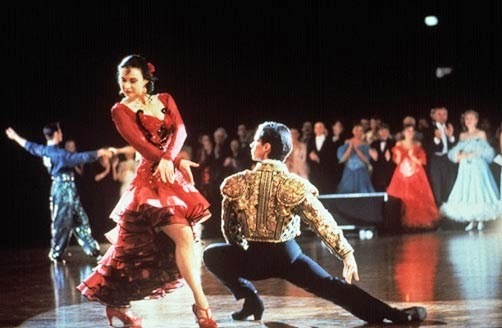 Strictly Ballroom is a proper feel-good film and honestly, I could talk about it all day. It's probably better if you just watch it though. I promise you'll love it. Ah, the moment no one has been waiting for. Yes, I finally caved and watched The Adventures of Priscilla, Queen of the Desert. Do you feel the suspense? Are you super excited to finally find out what I thought of this film? Have you already guessed that since the rest of this list has been dominated by films about drag queens and films set in Australia and that I haven't had a bad word to say about any of them that I probably loved this film too?? 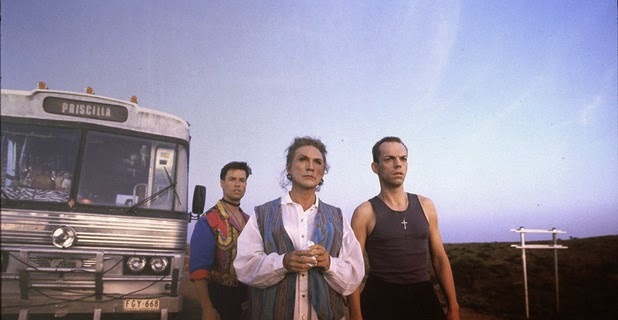 Tick, Bernadette, and Adam leave Sydney in a beat up old bus called Priscilla to travel across the Australian outback to Alice Springs, where they have been contracted to perform a drag act at a local hotel. What Bernadette and Adam don't know is that the woman who has hired them happens to be Tick's wife and that's not the only secret that Tick's been keeping. Obviously I loved this movie, let's just get that out there straight away. All three of the main actors are amazing, it's set in Australia, there's a fantastic soundtrack, it's funny, it's sweet, it's heartbreaking at times, it's pretty much got everything I love in a film. As soon as it ended I wanted to watch it again. I'm pretty sure that after just one viewing The Adventures of Priscilla, Queen of the Desert is going straight into my top ten movies of all time. But I think I'd better watch it a few more times just to be on the safe side. So there you are, the thrilling conclusion. Let me know if you've seen any of these films or if I've convinced you to give any of them a try. I hope you've enjoyed my somewhat disjointed reviews. 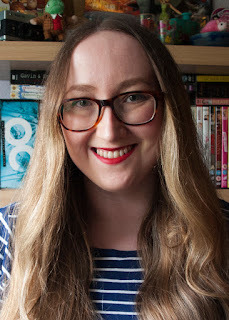 I realise they're not the most coherent but honestly, sometimes I find it easier to write about a film if I hated than if I loved it and luckily for me, maybe unluckily for you, I loved all of these films!